Price: $32; a lesser-featured version, Audio Hijack, is $16. Requirements: Mac OS X 10.3.9. Universal. I’m not really sure what the plan of attack was—at the time, we were still students, leading this quasi-Seinfeldian existence of days strung together as a collection of different places to loaf around. And I’m not sure we had anything to be interested in. So why anyone would listen to our podcast, I have no idea. In any event, Apple had given us almost all the equipment we needed in the intervening five years: a built-in microphone on every consumer Mac, an iPod in almost every hand in America, and universal Wi-Fi. The cable companies supplied the bandwidth, and, for those of us operating by remote, Skype made the entire world our oyster; and a cottage industry of would-be Tony Kornheisers, Carl Kasells, and Rush Limbaughs was born. All that was lacking was the glue to hold the whole thing together and make it into a recording. Without it, it would be a large-scale spectacle designed only for just one person, more like the family “newspaper” I published when I was eight than a piece of broadcast medium. All the audio would stream into my computer, and then be played back over my speakers, and that would be it. The solution, it turns out, is Audio Hijack Pro. It’s a piece of software designed to capture audio input and output from your computer, and route it into a file. This is one of those tasks that it does not necessarily occur to you to do—until you play back a video and realize you want to capture a piece of dialogue for a ringtone, for instance, or wish that you could listen to your favorite radio show on your iPod. Or, you want to record a podcast. It doesn’t really matter how it works, but essentially, it wiretaps the system audio stream, which can be split up by application or taken as a whole. Then, it can apply filters to it, and then convert the file (natively, an AIFF) to the format of your choice. Ta-da! That was the resolution I found to the question of how to make this inaugural podcast. The hitch: Audio Hijack Pro itself. If I were Malcolm Gladwell, here would follow a disquisition on the history of broadcast media, from Guglielmo Marconi to the state of the media at the arrival of the podcast, and then a few carefully chosen vignettes about the pioneering podcasters, Ze Frank, Amanda Congdon and Adam Curry, inter alia. And it would be 5,000 words of pure gold. It might even win me an American Society of Magazine Editors award. That’s not me. So instead, I will begin with brass tacks. Audio Hijack Pro did not do the task, for me, by any conventional definition of “work.” When the red light went off and I disconnected Skype, and we were no longer “on air,” such that it was, I opened the file to play it back. Our inaugural podcast was mysteriously choppy for the first few minutes. At somewhere in the neighborhood of eight minutes, it simply skipped forward to a point I knew to have been about three minutes later in our “broadcast.” The intervening three minutes hadn’t been recorded at all. Audio Hijack Pro, all set up for a podcast-recording studio session. At the time that this occurred, my computer had been in the ideal state for recording the audio. Only two applications were running, Audio Hijack Pro and Skype (version 1.3). My computer isn’t exactly state-of-the-art—a PowerBook G4 running at 800 MHz—but it’s well within the minimum required hardware parameters for both pieces of software. Skype requires a 400 MHz G3, and Rogue Amoeba does not even state minimum required hardware for Audio Hijack Pro. This unstated minimum required configuration seems to be the source of the problem, as it turns out. Developer Rogue Amoeba acknowledges, in the application manual, that recording skipping can be a problem, but I still had audio skipping even after following the troubleshooting instructions. I did not even see the warning, in the application, that there had been skipping at all, and did not know what it would look like until I consulted the manual to see what might have gone wrong. I was able to eliminate the skipping problem by running the most bare-bones configuration, encoding the audio to AIFF and certainly using no effects or manipulation at record time. I simply cannot recommend an application which failed at such a simple task, because most podcasts are rather less low-budget than mine, with music played back between transitions from iTunes, or pre-recorded interviews slotted in from QuickTime, or complex input filters. Without state-of-the-art hardware, you may find yourself struggling to make any of this happen. Your mileage may vary, but you’re probably driving more miles than I do, too. It’s a pity that this flaw was so pronounced, to be honest, because it was so easy to set up the recording. I looked into the business of recording a podcast via Skype once, some time ago, and at the time a whole menagerie of supporting software was required. Today it’s possible to set the entire thing up in Audio Hijack Pro itself: with just a few clicks, you can set up the required software monitoring to hijack the audio, including the input channel. This is a feature called Application Mixer, and in spite of my trouble, I think it’s a brilliant solution to this particular problem. In addition, Audio Hijack Pro allows you to mix in sound effects or interleaved music segments, which you can queue up for playback in real time, like a live radio show. Rather than simply having them jump in, you can fade them in and out, also using Application Mixer. Application Mixer: Your one-stop shop for podcast recording. As long as Audio Hijack Pro records all your audio. What’s really unfortunate about my experience is that there are plenty of more mundane things that Audio Hijack Pro does really well. For instance, there was a fantastic faux-Indian tune that was the theme music to the Absolut movie-mercial, “Mulit,” which I’d wanted to find a way to record since 2003. Audio Hijack Pro gave me a way to do that, easily, and didn’t skip any audio. And recording from live streamed audio, a task which would have made it much easier to listen to NPR’s “Wait Wait, Don’t Tell Me” before they launched a podcast, couldn’t be simpler: Once Real Player or iTunes has been hijacked, you can create a recording session from a streaming audio URL and give it a schedule. 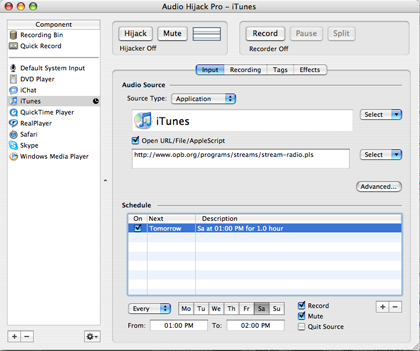 Audio Hijack Pro will then launch at the specified time, waking your computer from sleep if necessary, and capture its audio and save it to the specified file type. This functionality, too, went off without a hitch. I don’t know if NPR has finally made a podcast for “Car Talk,” but I’m rarely in my car on Saturdays anymore, so I used it to create my own faux-podcast, recording from KOPB in Portland, OR, which will always be “my” NPR station. Timer-triggered streaming audio recordings. Someone’s putting Mac OS X’s Unix background to work, methinks. In addition, Rogue Amoeba advertises Audio Hijack Pro’s functionality for recording analogue audio, like cassettes or records, or 8-tracks if you’re really hard-core, to digital files like MP3s or AACs. I don’t own any analogue media to try this particular feature out, because I’m a product of the digital era, but the Silence Monitor feature seems tailor-made for this task. As the manual describes it, it will attempt to decipher the gaps in tracks, and you can either not record the gaps or split the file into multiple recordings at noise gaps. Or, you can press the “Split”—that way, you can split “Blood on the Tracks” into its indvidual songs without having to manually monitor the record, but leave your “Thick as a Brick” as one MP3. I can see how this would be useful, even without owning a turntable. 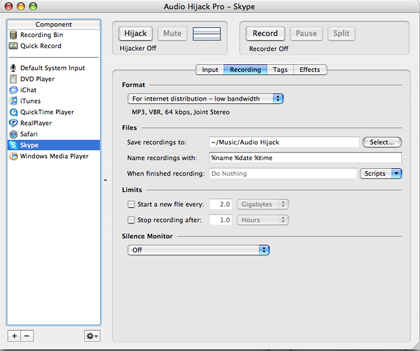 There’s also a less expensive version of Audio Hijack Pro, called Audio Hijack, which retails for $16, but it has a wide range of flaws that keep it from being useful for most of the tasks that make its Pro sibling so useful. It won’t record MP3s or AACs, it can’t merge multiple audio sources (like iTunes music transitions between segments in a podcast), and it lacks the Silence Monitor. It does have the timer-recording feature, but I’m not sure how useful that would be when it will only output AIFF files, Mac OS X’s native sound output format. These files tend to be very large, so while your iPod will play them, they will require a much larger amount of space for the same play time. You’d probably want to convert the AIFF files to MP3 or AAC using iTunes. Unfortunately, the skipping recording in my podcast—which would have been about an hour and 20 minutes, and ended up at about 35 minutes of recorded audio—keeps me from recommending the application more strongly. It’s likely that if I owned a state-of-the-art computer, I wouldn’t see this problem, but I can’t vouch for that. I’ve contacted Rogue Amoeba’s technical support, and the only solution that we were able to identify is to switch the recording to AIFF. This, in concert with only the most bare-bones recording options, kept the skipping to a minimum, but also eliminated most of the useful features. Rogue Amoeba really ought to consider publishing a minimum recommended hardware configuration for Audio Hijack Pro. With the exception of the relatively smaller numbers of people who either record their own podcasts, or capture audio in real-time in one format or another, it has long seemed to me that Audio Hijack Pro is an application in search of a problem. For that crowd, the problem is real, and Audio Hijack Pro may be just the solution. Caveat: Without the right hardware, you will probably find yourself highly limited in the features you can use in this application. Copyright © 2007 Wes Meltzer, wmeltzer@atpm.com. Reviewing in ATPM is open to anyone. If you’re interested, write to us at reviews@atpm.com. Too bad that you just hit below the hardware threshold for recording on Audio Hijack Pro. If your hardware is only 2 generations old instead of 3, there's no downside. I have a 1 GHZ G4 iBook that it records just fine with. And should be just fine on any hardware sold in the last three years, if you have enough RAM. Audio Hijack doesn't do mp3's but iTunes does. It's very easy to record to AIFF, drop the file into iTunes and select Convert to MP3 in the Advanced menu. (if your running Tiger you can even create an Automator action for this) Discard the AIFF to save space. It may be just a bit awkward but works for budget recording. I did that for a year before I finally ponied up the upgrade fee for the Pro edition. Before they podcast Science Friday I grabbed the show every week. I still use it for New Dimensions online broadcasts, which happen at 10 pm Sunday night in Seattle. I listen to a lot of podcasts or time shifted internet broadcasts during my commute. I'm glad I upgraded, though. There's a lot of functionality in Audio Hijack Pro for not a lot of cost. I've recorded with it too, both my own podcasts and presentations for our local MUG, though I normally use GarageBand for that. One thing to be certain of is to make sure that you make your recording buffers large enough (under the "Advanced" option)... too small and strange things can happen. As far as converting to MP3 goes, I highly recommend "Drop A Few My Way" from Doug's Applescripts for iTunes as the way to go! I've been using AHPro for about a year now to record my favorite radio shows - car talk, thistle and shamrock, hearts of space, etc - and I've found it to be relatively trouble free. I am currently running a shiny new 20" intel imac but I was running a 1GHz G4 flat panel imac previously without problem. The only glitch I have with the new imac is that it doesn't automatically drop my recordings into iTunes unless iTunes is already open. I have used AHPro for recording vinyl on my iBook G3, 700 MHz, 640 MB RAM. No problems with skipping at all; the only trouble I had was with the auto-split on silence function. To much noise on my old records for it to function properly, and this can hardly be blamed to AHPro. I think it is a very good piece of software. I like Audio Hijack Pro. For $32.00 can I install on both my laptop and desktop computers. This program doesn't work at all. Every time I press record, it doesn't record anything. Under the record button, it just reads Active: 0:00/b and doesn't do anything. Poo. very time I press record, it doesn't record anything. Under the record button, it just reads Active: 0:00/b and doesn't do anything, worst, it stop hijacking and finally quit. 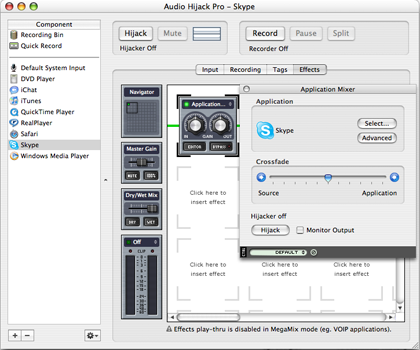 Although Audio HiJack Pro records straight Skype calls on my Mac very well, I can't seem get any of the plug-ins to work. I want to play my podcasts' theme music, and wav file listener calls, so that my co-host on Skype can hear them. I also want to split the audio tracks of my co-host and myself, so I can add effects and so forth separately. I'm using an older G-5 Mac Powerbook, if that is my problem. I love AHPro, but have one problem: I can't get it to record from iTunes itself. The VU meter bars pulse appropriately but there's no sound on the file that results. Otherwise it always does what I've asked it to do. I'm running it on a G4-17 1.33Ghz Powerbook with 2Gb of ram.